Well, I still haven’t gotten back to my leafy sea dragon yet, but that will be next. In the meantime, I thought you might want to see a sketch of how massive the manta ray is in comparison with this human in the ocean. Isn’t it amazing? They have a “wingspan” of up to 22 feet! What is even better about them is that they known to be friendly! When I showed this to my daughter, she said it was terrifying. Honestly, I would be in complete awe if I was a diver and was this close to a manta ray. Wow, wouldn’t that be a great experience? I think so, but I realize some people don’t love the ocean as much as I do. I hope those of you who celebrated Mother’s Day were blessed. My daughter took me to Turtle Bay and out to eat at a mongolian barbecue place. My husband opted to stay home and let us have some mother/daughter time. She works so much now, it was nice to go out together. I have come up with one idea for one of my stories. I intended on starting it today, but I want to finish the reading first. I did jot down my idea, though. So there’s that. 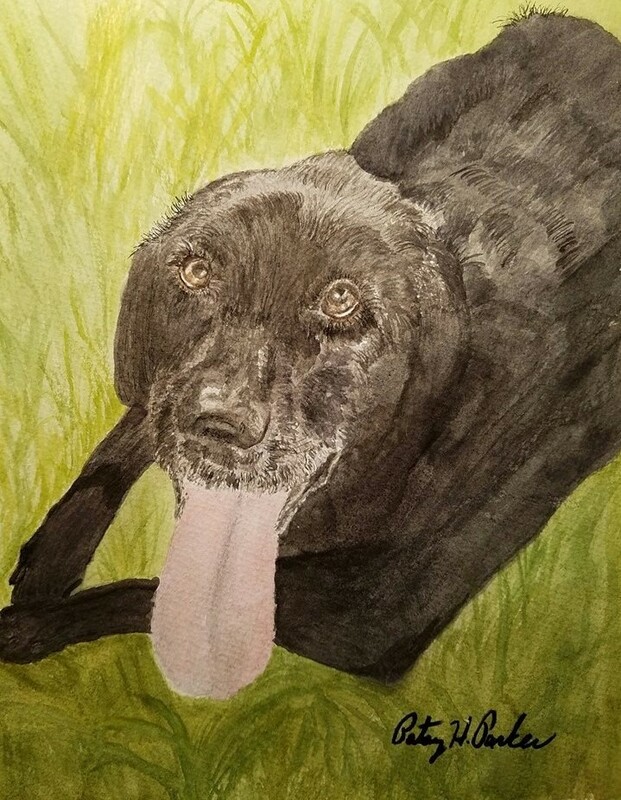 This is Sparky, a Labrador retriever who passed away recently. He belonged to some friends of mine whom I haven’t seen in many years but who are always going to be special to me, Tim, Maureen and Jamie Hatch. I will be mailing it to them soon. I just finished it last night. The original photo I worked from was on Maureen’s Facebook page. The lines in his form were difficult to see in some places but I printed it out and decided to try and paint Sparky anyway so they would have something special to hang up and remember him by in addition to their own pictures. The photo came out a little bit lighter than it actually is, though. It is in a black frame which really brings everything out nicely. I added grass around him instead of what was in the photo which was the inside of their car. I think they were on their way to the vet the day they took the photo. It is always sad to say good-bye to our pets. I have had to do it a few times with dogs and hamsters. The good news is that their memory will always be in our hearts. Hello everyone. 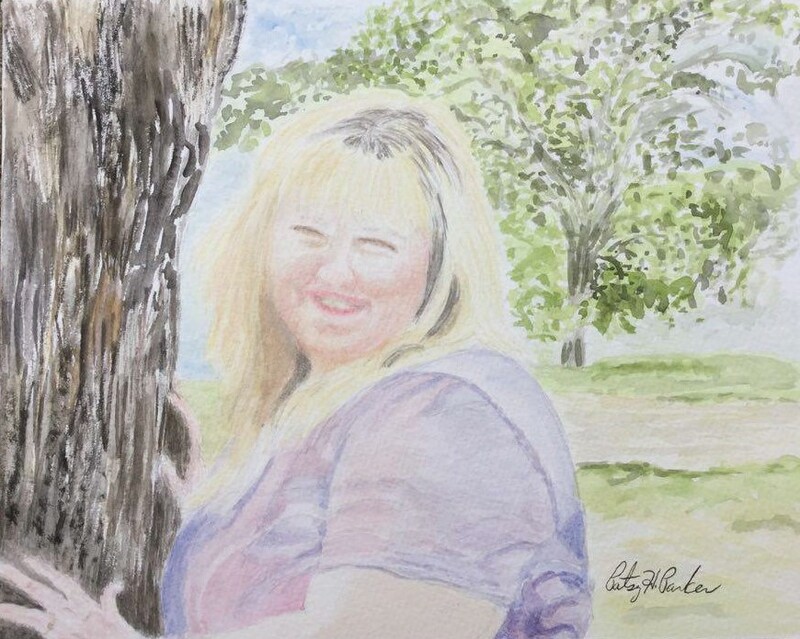 Well, this morning I finished the portrait of my friend, Mary Glenn, who died tragically in a house fire one year ago today. I framed it and took it over to her husband a little while ago. He was very touched and really loves it. I was very glad. It made me happy to give him something meaningful. He said he would always treasure it, and that meant a lot to me. Mary Glenn. RIP my friend. I miss you. Hello everyone. I just wanted to make a last post this year to thank all of you who read my blog or have just stopped in to take a quick peek around. I realize there are a lot of unfinished things on here that I began this year or maybe even longer ago, but that’s how life is for me…I don’t always finish what I start. When I was a kid, my mom used to tell me I never finished what I started so it became something I have heard in the back of my mind ever since. It was not always true, but the notion did cause me to feel guilty whenever I did not finish something I began. I know many people besides myself who struggle with this. Oh except for maybe the “type A” personalities or the “perfectionists” (of which I used to pressure myself to be.) But through the last 22 years of living with a “type B” personality, the more laid back kind of person that my husband is, I have come to realize that I think I have always been one, too. I just didn’t feel I could allow myself to be one when I was surrounded by those type A people who used to be in my life. Don’t get me wrong; I still love them, but I will never ever be one, and my acceptance of this has lifted a huge weight off of me. I think everyone should be who we are meant to be and not worry about trying to be like who we may admire or compare ourselves to; comparing ourselves to others really is a waste of energy. Last night I was telling my husband that I feel like I didn’t accomplish much this year (still struggle with the “I’m not good enough LIE”,) but then this morning I realized that in the past year I have been building friendships that I think will last the rest of my life, I have done as much art as I desired to do, I have read 128 books (26,680 pages) this year which is crazy! I set my goal at 75 books so this was a surprise! Granted some of those were children’s books when I was checking them out from the library and getting ideas about picture books, but hey! A book is a book…in my book! 😉 So all in all I think it has been a pretty good year! I worked out a lot, but got a little lax in that area in the last few months. However, my daughter’s school is relocating to a building within walking distance of the gym I go to which will be great for the rest of the school year. After that I may not keep the membership since I won’t technically have to go to town for her next year. She graduates this coming May! I am very proud of her. In the meantime I will still use the gym on the days we go and work out at home the rest of the time. I find it hard to structure my time, however, when I don’t have to go anywhere for anything in particular. I just get myself so distracted so easily! When I was homeschooling the kids, we had some structure but it wasn’t really strict; as long their work was done and they were learning, I was happy. And they made it through just fine. So what is next for me once she learns to drive and can go do what she wants to do – either work or go to community college or both – I’m not really sure yet?? I may just take a year to spend as much time with my sweet husband as possible when he isn’t working. I may try to get back to some writing projects I have started. I may get more serious about really working on the picture book ideas I have. Or I may just bask in the sun on nice days, sip on some tea, and read a great book (maybe I’ll make it to 200 books some year in the future.) I do love my solitude! What I have learned in the last few years is to slow down in life. I think of life as a marathon, not a sprint. We had to learn to crawl and walk before we could run; now that I am on the other end of my life’s spectrum, it is time to learn to walk and crawl again. Some days my body won’t let me do anything except barely walk anyway! HA, HA! So my dear friends I am ending 2016 feeling thankful for God, my family, my friends, our health, and all of the love that has been given me this year. I pray I gave as much or more than I received. 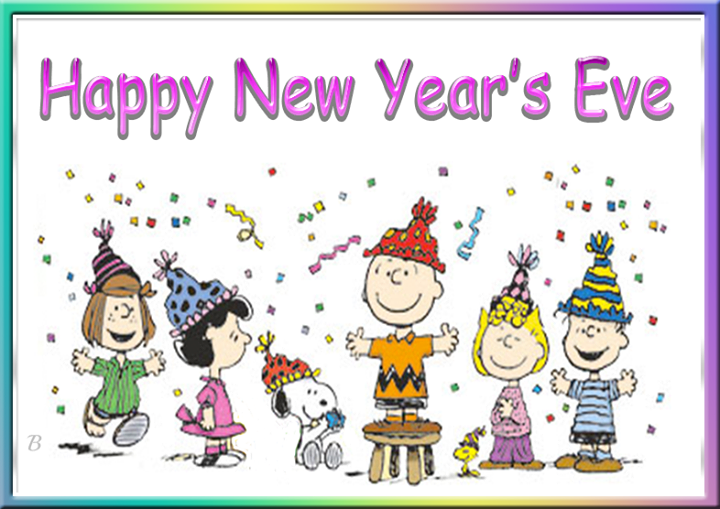 May 2017 be another year of love, joy, peace, and sweet friends and family to cherish for everyone. God bless you all! Hello everyone. This will seem like a weird post today since usually I am posting about art, artists, or showing my own art. Well, I haven’t done any art in the last few weeks due to dealing with bronchitis. I have had it for at least a couple of weeks. It started out as a cold, then swiftly moved down to my lungs when all of the annoying coughing started! So I have been coughing so much up until today…somehow I am experiencing a reprieve right now…that I couldn’t type, draw or paint at all! It has been distressing to say the least. I have not been sick like this in at least ten years. I have had occasional colds here there that never became nasty, but nothing like this! My husband had it first, so I got it from him. I am just hoping the kids don’t get it, because my daughter doesn’t need to miss school, and my son just started a new job! Plus, they have Halloween plans that I would hate for them to have get wrecked by sickness. On Halloween they are going to be dressing up as Shaggy (my son) and Scooby-Doo (my daughter) along with a few other friends who will be the rest of the gang. My son found some great pants and shoes and has the Shaggy walk down pat. We have yet to get my daughter’s costume or make it somehow. There is also a Mystery Machine van ride in front of a grocery store that they plan to go to and get pictures in front of it. I think there may be room for one person to sit in it. I just hope their plans work out well this year. Missing Pieces by Heather Gudenkauf – She is a wonderful novel writer! I have read all of her books…I think? Anyway, she weaves a good story with lots of twists and turns! Andy Warhol: Prince of Pop by Jan Greenberg which has been mentioned in a previous post of mine. The Girl in the Red Coat by Kate Hamer – a really good mystery novel, but I didn’t enjoy the ending so much. I just expected more in it. For me it was disappointing. Topaz Moon: Chiura Obata’s Art of the Internment by Kimi Kodani-Hill – an informative biography about a man’s experiences teaching art in a Japanese internment camp. The Woman Warrior by Maxine Hong-Kingston – this is actually a novel that I’ve heard is based on the author’s or her relatives’s lives. I haven’t researched it much, but some think it is an autobiography when it is not. Pretty Girls by Karin Slaughter – This author is very good, however, this was a tough novel to read. I almost put it down a few times, but the mystery needed to be solved in my head! The content is about a very sick serial killer so if you don’t like that topic, don’t read it! Dear Teddy by J. D. Stockholm – This is the first of a series of autobiographical books that are a journal about the very sick abuse he suffered at the hands of his parents and someone he can’t remember who he names “the bad man” in the book. This was difficult to read because of the nature of the type of abuse this person went through. I almost didn’t finish it because it is hard to stomach how evil some people can be towards children. I am not sure I will read the rest of them, because he wrote this in his 5 year old self’s voice which I did not enjoy very much. A Head Full of Ghosts by Paul Tremblay – the description on this was misleading. I thought it was going to be about the early onset of schizophrenia in a teen-aged girl. Also, it is a novel. However, it was about her dad taking her to a priest for exorcism because he believed she was demon-possessed. I lost interest half-way through so I didn’t bother finishing this one. Yesterday I went to the library and checked out a few more novels and an autobiography. The autobiography is one I have never seen or heard of before. 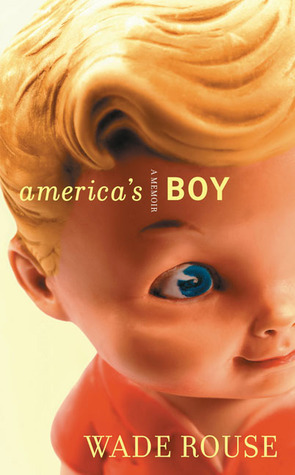 It is called “America’s Boy: A Memoir by Wade Rouse. It is very good, but it has a creepy looking cover in my opinion. Those old-fashioned dolls just look strange to me. Anyway, it is about a man’s childhood of self-discovery. He is mistaken as a girl for years, but also has desires to dress in his mom’s jewelry. He feels different than other boys and finds himself attracted to some when he is older but suppresses his desires. He was born in 1965 and grew up in a town in the southwest Missouri Ozarks where in that time frame no one talked about these issues! His writing is done well and he tells his story in very short chapters which makes it easy to read for me. I personally don’t like bogged down autobiographies or biographies which has shown me that I don’t like mine! I began trying to write my life story a few years ago, but I have so many gaps in my memory that it was hard to keep the story going. So I think I am going to try this type of approach and break it down in very small portions when I get the energy that is. The novel I began a couple of nights ago is called “In a Dark, Dark Wood” by Ruth Ware. It is definitely one I can hardly put down. It’s pretty intriguing so far. I have also been reading The Princess Bride by William Goldman for comic relief! I have seen the movie many more times than I could guess but had just never read the book. So that is what I have been up to. I have not had the energy or inclination to do any art in the last few weeks, but hopefully soon I will feel well enough. In the meantime I am going to read as much as I possibly can. I am an avid reader anyway, but sometimes mores so than at other times. To all my blogging friends who love to read, what are you reading right now? I am interested to know! Hello friends! Well, I know I promised to post this a couple of days ago, but at this time of the month our internet service slows down a whole lot during normal daytime hours. So I happened to wake up a few minutes ago, and it is only 4:00 a.m. right now and decided now is as good a time as any to get this done! I went to bed early, and I don’t have to go anywhere today! In other news I began practicing my Chinese brush calligraphy yesterday, and I think I will be learning that for the rest of my life! Wow, it is difficult! I really want to find someone locally who does it and might help me so I don’t develop any bad habits! I don’t know if that will happen, but in the meantime, I will keep on keeping on! I hope everyone is having a nice end to the summer months. We were able to leave our air conditioning off last night. As I type now there is a nice cool breeze coming through the window. Fall is on its way…I hope! We do sometimes get a few really hot days or weeks in September so I know the hot weather isn’t quite over yet. Well, I’m going back to bed! Here is the Stickleback fish below the waterfalls! I had a lot of fun painting this. I did it on Wednesday when my son took my daughter to school. It is so great to get to stay home three days a week now. This school year is not going to be quite as stressful for me with my son helping with the driving. Although, now she is only going three days a week due to needing to drop a class which is fine. So we get 4 day weekends now! Yay!! 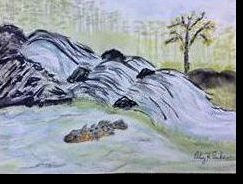 When I painted this I was using the book “Chinese Landscapes Made Easy” by Rebecca Yue. My waterfall is similar to the one she shows in her example, but I did change it up some to make it mine. I was working on using the dots and long dots strokes for the trees and the diagonal strokes for the rocks. The fish is really too big proportionally as I said in my last post, but I don’t have the smallest size Chinese brushes yet, and I didn’t want to use my regular watercolor brushes. I have ordered some other Chinese paint brushes that I hope to receive next week. I should be getting this book today! 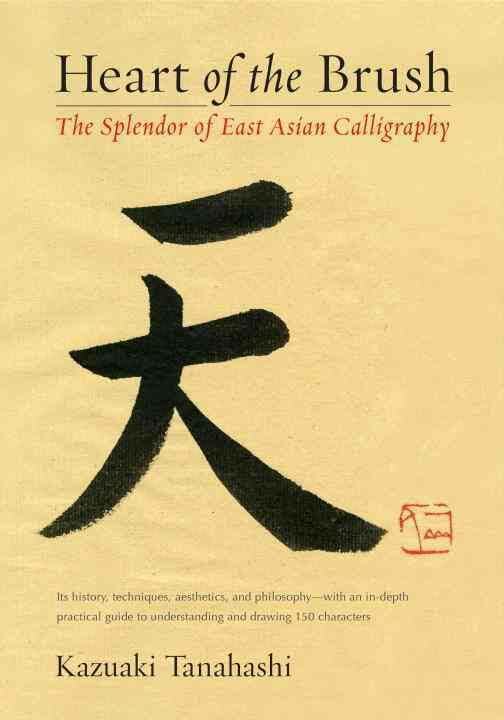 This is the book I mentioned in an earlier post that teaches how to do East Asian calligraphy, and I am very excited about it! So hopefully in time you will see some of this, too, in future posts. 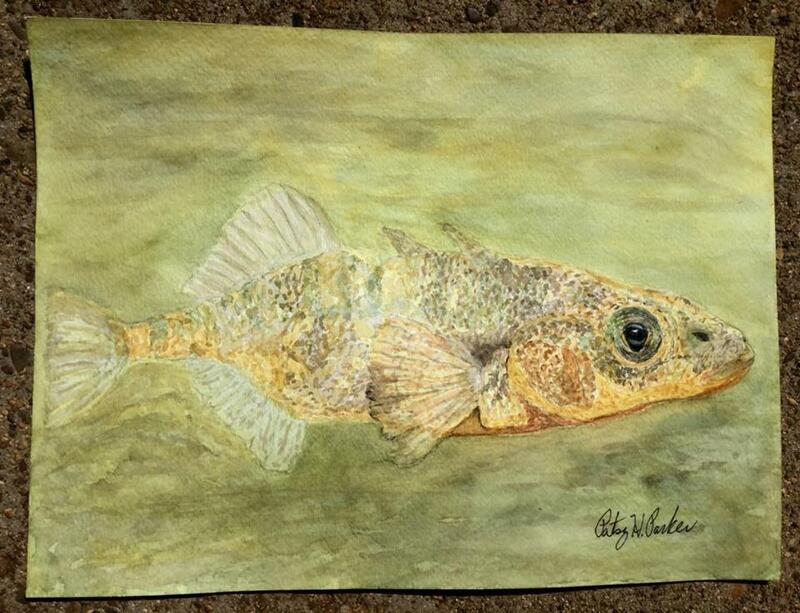 So you will see me again when I get Derrick’s Stickleback fish done, which I am planning on working on right now! In tribute to him I will say I am enjoying my Southern iced tea with fresh mint leaves as I paint!